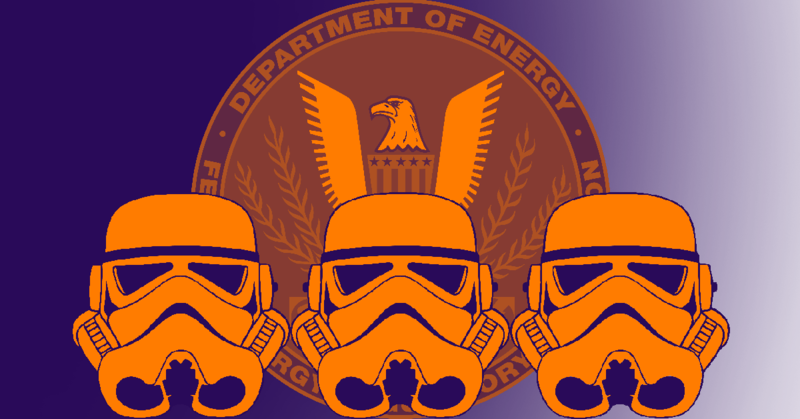 Not one more Climate Denying FERC Nominee! This is bad – red-alert, 4-alarm BAD. But I have good news, too. On October 16 we’re going to the Senate with friends from Beyond Extreme Energy (BXE) to deliver a loud and clear message: We can’t afford one more Climate Denying Trump Nominee in charge of our energy policy. 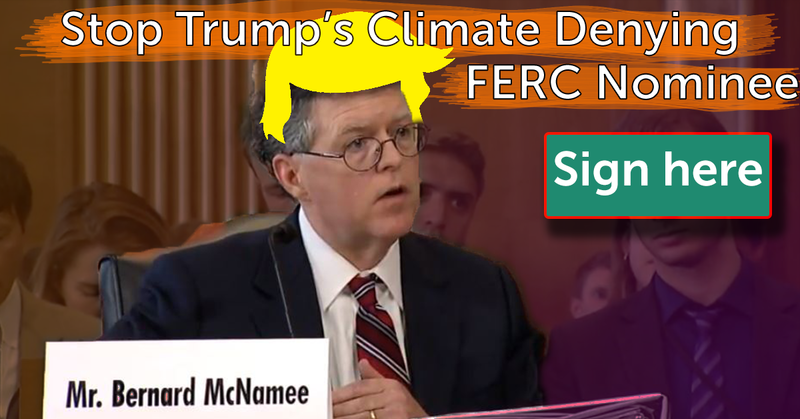 The Senate must vote NO on McNamee and stop Trump’s FERC! 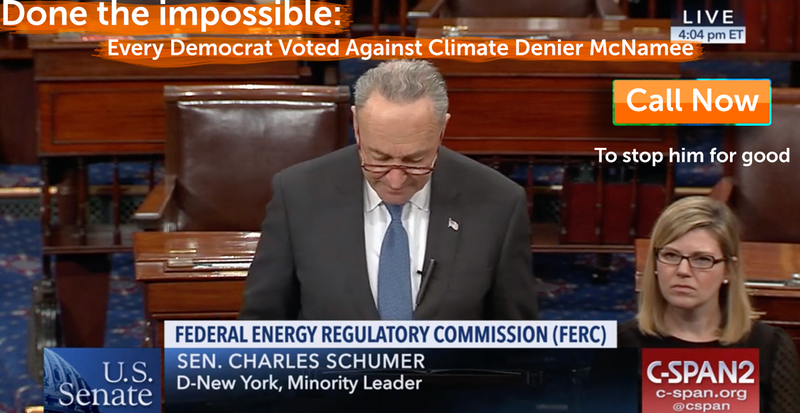 Let’s be perfectly clear: We think any nominee is a bad idea, because preserving the deadlock at FERC – where the two remaining Democrats are often at odds with the two remaining Republicans – is our best chance at stopping new pipelines and other fossil fuel infrastructure projects. But even allowing that we don’t want anybody to be confirmed, McNamee is worth fighting. He has been a lifelong advocate for fossil fuels, and is a climate denier. 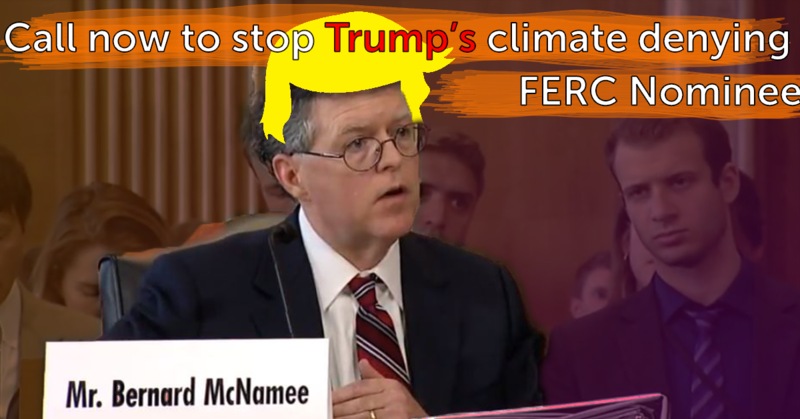 Sign here to demand the Senate vote vote NO on Trump’s latest climate-denying, community-wrecking nominee; Bernard McNamee! He’s completely unqualified to oversee energy policy: He has no experience in the utility or natural gas utility industries, let alone our complicated and interconnected system of electric utilities. He once wrote a letter to The Hill about how fossil fuels “dramatically improve the human condition” – on Earth Day no less! More importantly, he was a leading author and architect of Trump and Rick Perry’s dangerous plan to bail out coal and nuclear plants last year; a plan so obviously biased in favor of fossil fuels and the corporations who profit off them that even FERC voted 5-0 to deny it. 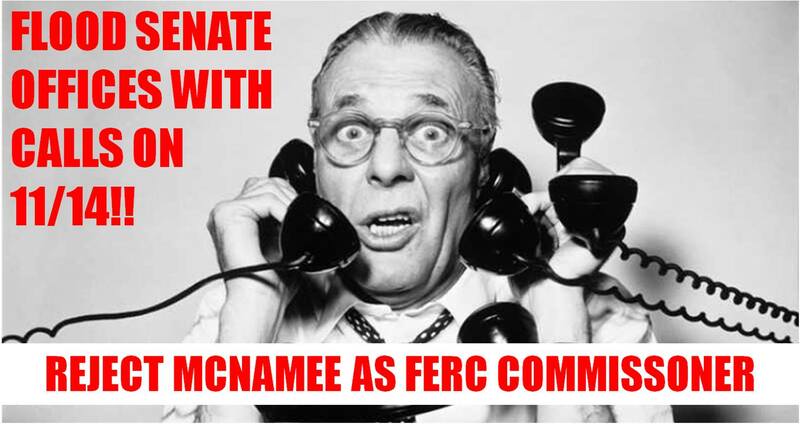 After the unanimous rejection by FERC, McNamee has been hard at work looking for a legal, or extra-legal loophole to order that we pay some $34 billion in subsidies to failing coal and nuclear plants. 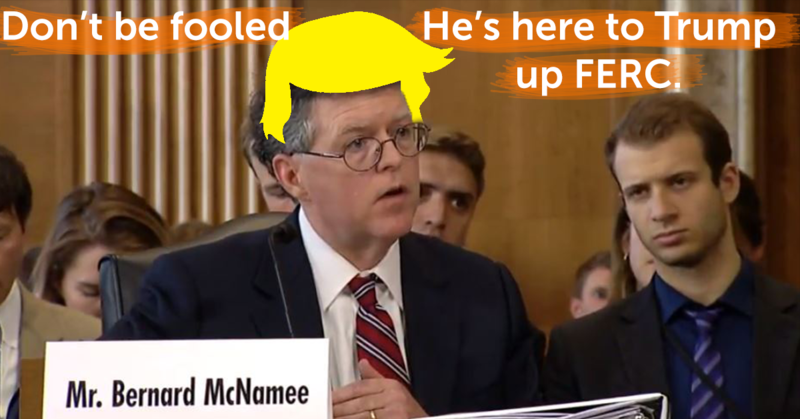 McNamee is clearly unqualified, dangerous, and denies the urgent, imperative science of the most recent report from the UN Intergovernmental Panel on Climate Change – which unequivocally states that we have to cut all emissions of global warming pollution (including methane which is ~80x more potent of a climate-pollutant than Carbon Dioxide) 50% in 12 years, and 100% by 2050. It’s up to our Senators to ask serious questions of McNamee, and the remaining four commissioners who have allowed the agency to become mired in partisan, climate-denying scandal. And ultimately, it’s up to each and every one of our Senators to vote NO on McNamee. Sign here to tell them so. Have you met Brett Kavanaugh, Trump’s nominee to the supreme court? 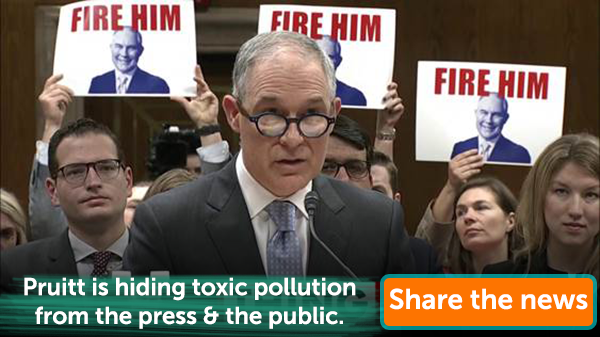 He’s everything you expect, and more: He’s ruled in favor of more mercury in our water, more pollution in our air, and he has it in for the EPA and climate science. But there’s something nobody knows about Kavanaugh, something the Washington Post this week called a “nightmare scenario” for the constitution and our country: Whether he would use his position on the Supreme Court to rule that Trump is immune from investigation and prosecution, creating a lawless presidency with Trump in control. Scared yet? Me too. Call (202) 224-3121 and tell your Senators to vote NO on Kavanaugh. Don’t forget to call back and tell your other Senator (we all have 2) the same thing! Robert Mueller is actively investigating Donald Trump and his associates over whether they colluded with Russia to fix the 2016 Presidential Election. Trump’s legal team is stone-walling, refusing to let Trump be interviewed because if he does, they’re worried he’ll perjure himself, lie to the FBI or confess to a crime (as he’s already done on twitter). Mueller therefore is likely to subpoena Trump, setting up an unprecedented legal showdown that can only end at the United States Supreme Court later this fall. But here’s the scary part –Trump and McConnell have already announced plans to fast track the Kavanaugh nomination, with initial hearings scheduled in the next few weeks. If confirmed, one of his first decisions could be to rule that Trump is above the law, and shut down the Mueller investigation subpoena. 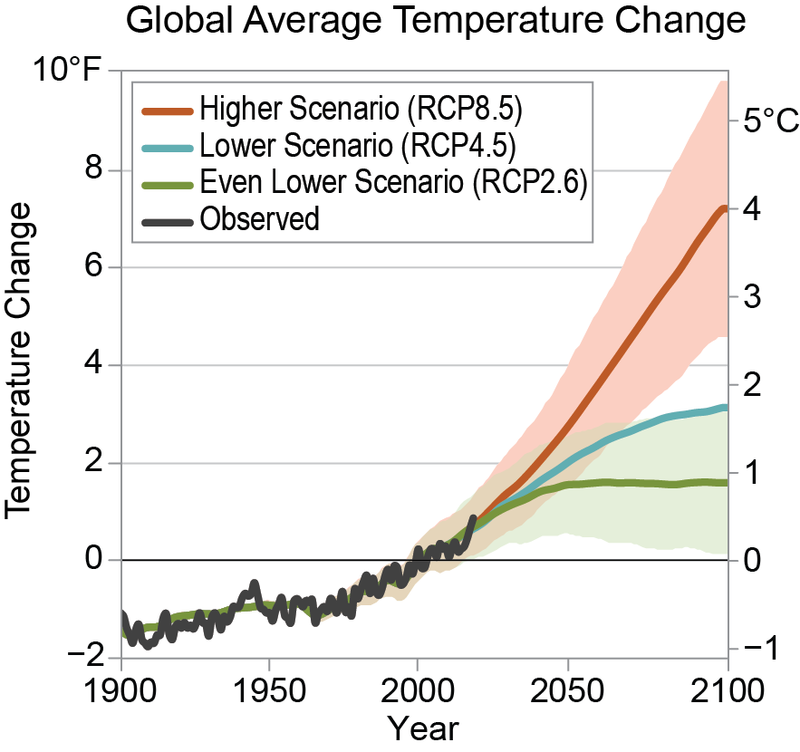 We can’t let this happen. Call (202) 224-3121. to your Senators and tell them not to allow Kavanaugh’s nomination to have a hearing or a vote. It’s not outlandish to think Kavanaugh will protect the president that appointed him to a lifetime term on the Supreme Court. After all, Kavanaugh has already said he thinks the SCOTUS ruling that forced Richard Nixon to hand over the Watergate tapes was a “mistake.” He’s also said that sitting President’s can’t or shouldn’t be investigated (despite the fact that he investigated President Clinton when he was desperate to make a name for himself). And Kavanaugh’s time working for George W Bush shows that he believes a President can pick and choose which parts of the law to enforce, based on his own interpretation of the constitution.